Salvage materials sounds like things you might find in a junkyard. Although that is definitely a good place to look it doesn’t mean that’s your only resource. Craigslist has a “free” section where folks are looking to give away their leftovers from a construction project. All you have to do is go pick them up. You might be surprised at what you can find here. You need to let your contractor know up front that you working on the budget and want to stick to that budget. A contractor isn’t working for free but that doesn’t mean they should be allowed to markup everything. You might be able to save money by buying the building supplies and materials on your own. Discuss this with the contractor in advance and get a list of the specific items that he needs. He does offer to buy them, then ask for receipts to make sure you’re getting what you paid for. You may need money for your remodel but that doesn’t mean you should finance the project. That could have you ultimately spending thousands of dollars more than you should. It’s best if you have the cash up front. Plumbing and load bearing walls are two things that you should never consider moving. The same goes for relocating outlets. Anytime you have to move those elements around is going to cost you a lot. There’s a lot of the work of a remodeling project that you could do in your own. If you are getting new cabinets that have to be assembled, then you could certainly put those together very easily. You could also tackle your own demolition. Work gloves, goggles and a good set of tools is what you need to make that happen. When you’ve tear everything down, make sure Junk King BucksMont is standing by for the cleanup. 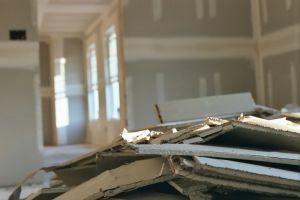 You can schedule session with these junk removal professionals to take away all your demolition debris in a single session. While you’re remodeling the home, you might want to get rid of all the other unwanted furniture, appliances and other household goods. That can all go to the back of the Junk King truck. The best way to save on your next remodel project is to plan ahead, do research and partner up with Junk King BucksMont for the cleanup. This entry was posted in Bucks County Junk Removal and tagged construction waste, demolition, junk King BucksMont, remodel project on June 30, 2017 by Junk King. Last updated June 30, 2017 .